Scooper - Technology News: How long should a week be? How long should a week be? We can learn about the need for coordination in production from the experience of the Soviet Union. 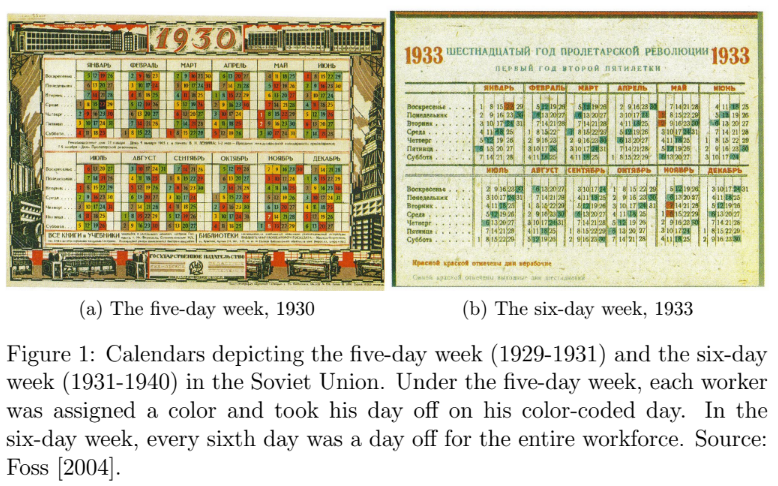 Between 1929-1931, the Soviet Union operated on a five-day cycle, in which, on any given day, one-fifth of the workforce had the day off. Historical accounts suggest that lack of coordination at the workplace led to accountability problems and to a loss in productivity that eventually resulted in its abandonment. This historical experience illustrates two things: first, that there is value in coordination, and, second, that societies can choose to coordinate on different work schedules. How, then, should we choose which schedule to coordinate on? To address this question, my paper "The Week" considers a simple model that incorporates two key considerations: preferences for leisure and labor productivity. The first consideration captures the familiar tradeoff between leisure and consumption. If people work less, they will produce less. The optimal week should balance people's desire for leisure with their desire for income. Fortunately, we can learn about people's preferences for leisure by looking at the market overtime premium, which captures the extent to which people demand extra pay for working on their day off. The overtime premium suggests that two weekly vacation days are consistent with most individuals’ preferences. The second consideration relating to labor productivity is more complicated to assess. Labor productivity can be affected by the work schedule through two opposing channels: fatigue, which implies productivity losses from long workweeks, and on-the-job-learning, which implies the opposite. Empirical literature documents that both channels are quantitatively important. For example, Pencavel (2015) reports that for munition workers during the First World War, Sunday work was associated with productivity losses. This is evidence of a fatigue effect, or a negative relationship between work time and productivity. In contrast, there is a body of evidence suggesting that both part-time work and prolonged absence from work are associated with productivity losses. This is consistent with the view that there are some returns to experience, and that on-the-job learning is an important component of labor productivity. In contrast to the fatigue effect, this channel implies productivity gains from longer workweeks. An important insight that emerges from these regularities is that, while both channels are quantitatively relevant, they operate on different frequencies: short-run variation in vacation time, such as occasional Sunday work, affects productivity mainly through the fatigue channel. At the same time, permanent changes in work time, such as part-time work, may affect productivity through the skill accumulation channel. This suggests that workers are particularly productive when returning after a long weekend, because there is a substantial decrease in fatigue and only a negligible effect on the levels of skill or experience. However, if workers were to take a three-day weekend every week, the cumulative reduction in work time would lead to skill erosion (or slower skill accumulation) and possible productivity losses. This observation implies that there are productivity gains from spacing out vacation days. A schedule in which Wednesdays and Sundays are days off (and Saturday is a workday) would be associated with a reduction in fatigue due to more frequent rest. Given that the proportion of work time remains the same, there would be little loss to skill accumulation. To summarize, a formal examination based on empirical regularities documented by the labor literature suggests that altering the structure of the workweek may be associated with significant changes in productivity and welfare. Crucially, while the model does not deliver strong predictions regarding the optimal proportion of vacation days (which, depending on parameters, ranges between 3/7-1/4), it delivers strong predictions regarding the optimality spacing out vacation time. The answer to the question of how long the workweek should be is: shorter, but the weekend should be shorter too.